Clear water does not necessarily mean clean water, it may contain colorless impurities, such as ammonia and nitrite, that are harmful and can kill pond fish. Pond fish excrete urine and produce feces, and ammonia is excreted through the gill membranes. Also debris collects in ponds. 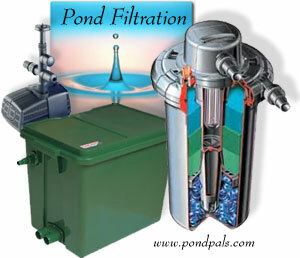 It is the job of the Pond Filter or water garden filtration system to remove waste which in the wild would be diluted by the large volumes of water or washed away by moving water. We carry a variety of pond filtration systems from the leading manufacturers: Aquadyne Bead Filters, Aquascape, Aqua Ultima II, Atlantic Filters, Biological Filters, Fishmate, Filter Media, GC TEK, Laguna, Little Giant, Matala, Natural Filters, Oase, Pentair, PondMaster, PondMax, and Waterfall Tanks. Sand filter. Some pond fish keepers use a sand filter as a final stage to 'polish' the water. The water is passed under high pressure through sand and comes out very clear, bacterial activity also takes place in the sand filter. Sand filters are expensive though, and you can't make one yourself because of the high pressure involved. Biological filtration turns ammonia into nitrate which is harmless to fish (unless at extremely high levels) but the disadvantage of this is that algae love nitrate and you get an algae bloom. There are two types of algae problems, green water and blanket weed. Green water is caused by microscopic algae in the water, it is not harmful to pond fish, actually it is beneficial, the pond fish eat the algae and it enhances their color, but you can't see them! Also in summer the algae use oxygen and leave the fish gasping. There are various ways to get rid of the algae : a vegetable filter, plants will use the nitrate so it is not available for the algae; an ultra violet (UV) filter kills the algae as it passes through; algaecide chemicals can be used but the problem will just recur; magnets placed on the filter pipe will disrupt algae cells internally, killing them or preventing them reproducing. Blanket weed is filaments algae and forms long green strands, it is not really a problem, it uses up nitrate and stops green water occurring, but it is unsightly. Vegetable filtration, algaecides and magnets will all work on blanket weed, but UV filtration will not as the algae has to pass through the filter to be killed and blanket weed is attached to the pond walls.